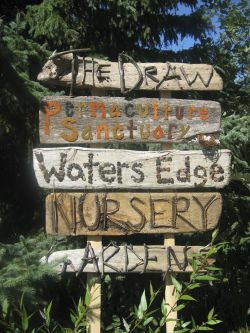 Welcome to the online home of The Draw, a land-based regenerative community; Stewards Draw nonprofit; and Waters Edge Nursery & Gardens. We hope this website also serves as an online resource for regenerative design. Thanks for visiting. We choose to manifest a life in which we embody the truth of our interconnectedness with all that is, and we commit all that we are to creating health at all levels of being. We believe that the Earth is sacred and we have chosen a lifeway in which we are healers of her. For us, nothing that does harm to her is worth the price that must be paid by the future of all life. We believe we must expand our concept of “self” to include our family, community, and land. We choose to become indigenous: saturating the land with meaning and story, animating her, blessing her, realizing we are a part of her. From our indigenous, animistic, permaculture story we attempt to bring forth a diverse and fecund ecosystem that will nourish our ‘whole body’. We create food forests, marshes, savannah, and perennially-mulched no-till annual polycultures to re-envision food production. Using highly efficient heaters, super-insulated naturally built buildings, and appropriate site design we decrease our negative impact. Our life is our love made evident. Content © 2008– by respective authors. Powered by Jekyll and GitHub.